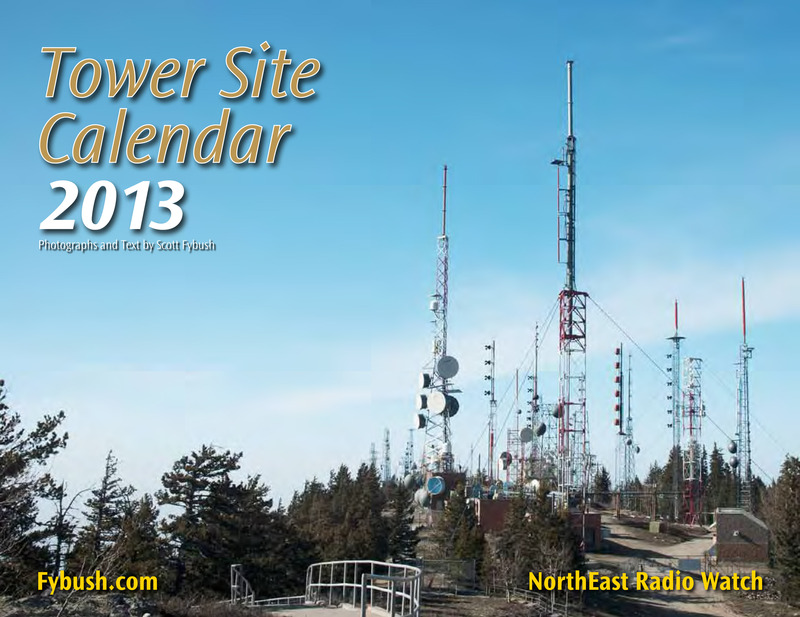 We’re taking a break from our trip through the brand new Tower Site Calendar 2013 this week to bring you some breaking news, or at least as close as we get to it here on Site of the Week. One of this week’s featured stations is about to flip from public radio to religion later today, while the other will be flipping from commercial AAA to public radio early next year. And while it’s been a long time since we’ve visited either one, we’re pleased to dig way back in our archives and share those visits with you. We start this week with the public station-to-be. Earlier this week, Aritaur Broadcasting announced it’s selling the only commercial station on Martha’s Vineyard, WMVY (92.7 Tisbury), to Boston’s WBUR-FM (90.9) for $715,000. That sale includes only the class A signal out here on the Vineyard; a separate entity, the non-profit “Friends of MVY,” will acquire the station’s intellectual property, including its adult album alternative format, and will keep “MVY” going as a listener-supported streaming audio service if it can garner enough listener support. 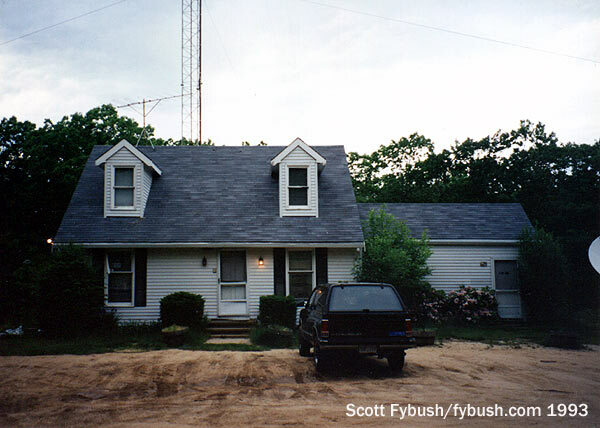 There was no such thing as streaming audio yet when an island taxi deposited us at the little Cape-style house down a dirt road one autumn afternoon back in 1993. Back then, “AAA” was just getting started as a commercial reality in many larger markets, but WMVY was already an established veteran in the format, having been playing it since its debut in 1981. 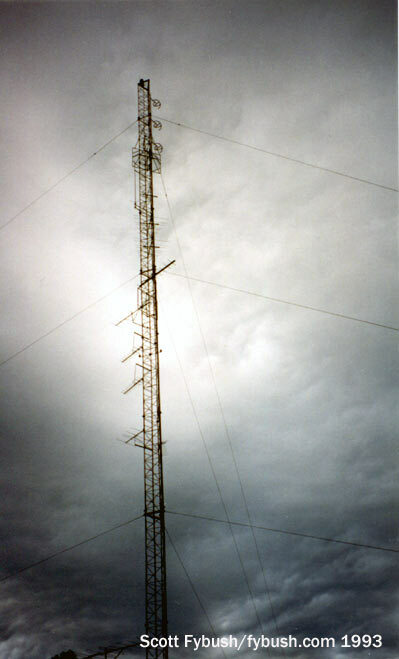 WMVY was actually the second attempt at a commercial station for the island at this site. The first entry, WVOI (“Voice of the Island”), signed on in 1974 under the ownership of the Wasque Corp., operating with 3,000 watts on 95.9. It didn’t last long; by 1978, the FCC had dismissed a proposed station sale and WVOI had gone silent, with its frequency moving to Marshfield on the South Shore to become the new WATD. 92.7 was the replacement channel out here, and WMVY was much more successful than its predecessor. The blue-and-white WMVY bumper sticker, featuring a musical staff, became a fixture on a generation of island cars (you can see one above the production room window in that shot just below). Despite a signal that didn’t even cover the entire Cape, never mind anything west of the Bourne and Sagamore bridges, WMVY developed a cult following among those who could hear it off-island, so much so that other broadcasters put it on translators in Newport, Rhode Island (where it’s still being heard on 96.5) and on the Cape proper, where it was being relayed for a time on 93.9 and 100.7 before those signals switched to a different parent station. Back in 1993 (can it really have been almost 20 years ago that I took these? 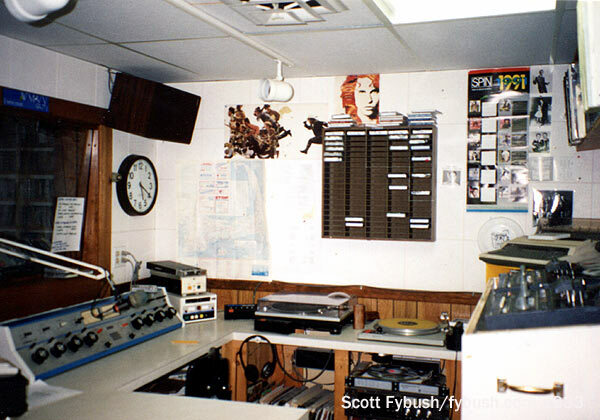 ), WMVY’s setup on the island was a simple one indeed: three studios with rotary-pot boards handled all of the station’s needs. 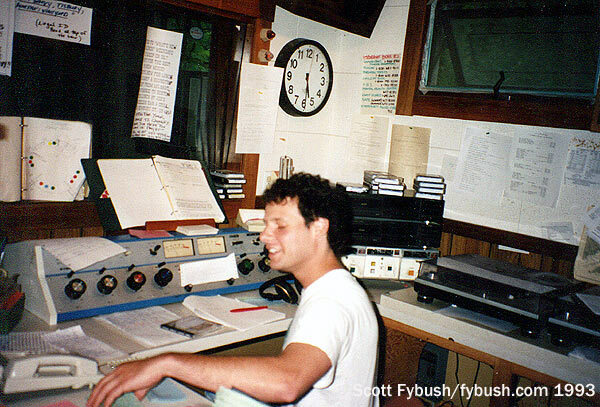 That island guy in the picture of the main air studio was Mitch Wertlieb, who today wears shoes and heavier clothing to work in his current gig doing news for Vermont Public Radio; back then, he was WMVY’s news director and pulled some weekend airshifts as well. 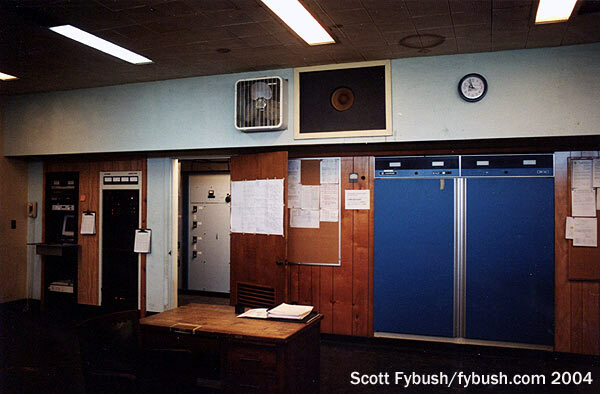 There was a small production room and a newsroom, and a few offices, as well as a transmitter room holding a rack of gear and a Harris transmitter, and that was that. How about a venerable commercial station that spent more than 35 years as a public radio station and is now about to go back to commercial operation? By the mid-1930s, WEBR had established its studio home at 23 North Street, just off Main, where it would remain for more than 60 years. WEBR’s transmitter (250 watts on 1310) was firmly planted on the roof of the Larkin Company building on Seneca Street. By the time NARBA shifted WEBR to 1340 in 1941, the station was in the hands of the Buffalo Evening News as part of a short-lived duopoly with WBEN (930). When duopolies were outlawed a few years later, the News sold WEBR to its competitor, the Courier-Express, which eventually added WEBR-FM on 94.5 (later WBCE and WREZ). After World War II, WEBR began pushing hard to get a signal to match its higher-powered competitors. WGR (550) and WBEN both boasted 5000 watts, and WKBW (1520) was broadcasting with 50,000 watts. By 1946, WEBR was embroiled in an FCC battle with two other stations, WICA (970 Ashtabula OH) and WWSW (1490 Pittsburgh), to determine which would end up with fulltime operation on 970. 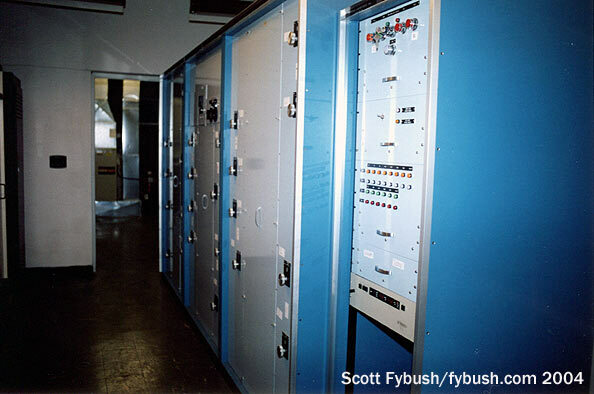 The development of more advanced directional antennas made it possible for all three stations to operate on that frequency, each with a fairly complex and very directional 5000-watt signal. WWSW ended up with an eight-tower array beaming south from what was then the very northernmost reaches of the Steel City, WICA pumped most of its signal north into Lake Erie from a four-tower array, and WEBR went as far south as it could go from downtown Buffalo, building an array of five self-supporting Truscon towers on Cloverbank Road down in Hamburg, a few miles south of the WGR/WKBW diplexed array. To prevent interference to its new channel-mates (and to older 970 occupants such as then-WAAT in Newark, NJ), the new 5,000-watt WEBR signal on 970 was rather more directional than its local competitors, putting plenty of signal for its day into the city of Buffalo but very little into the new suburbs that were extending east and increasingly south of the Queen City. 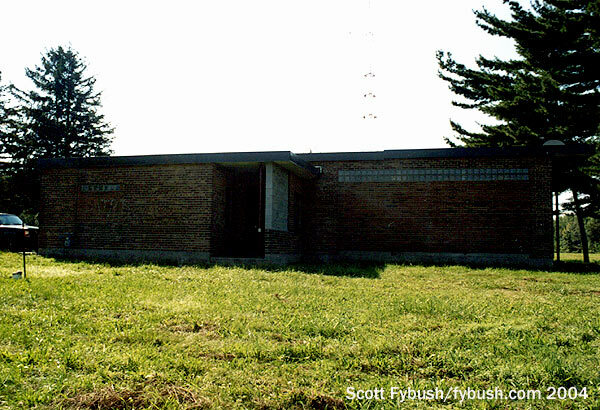 As for WEBR’s old facilities, they didn’t sit idle for long. The rooftop tower east of downtown was soon occupied by WBNY (1400), which had been at a different rooftop site. 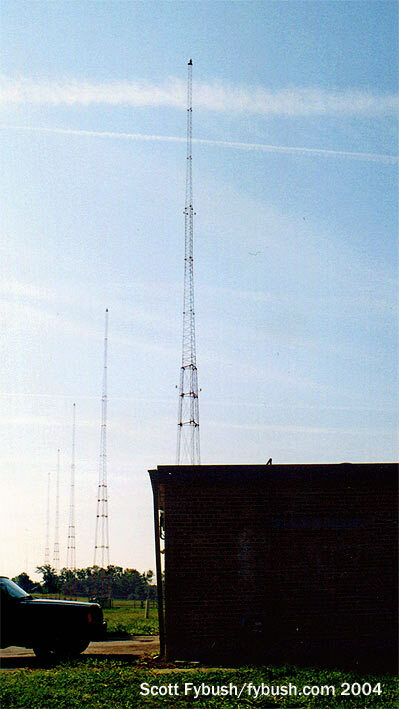 WBNY became WYSL in the early 1960s, and remained at the Larkin rooftop until moving to a new tower off Grider Street (near the interchange of the Kensington and Scajaquada expressways) in 1978; today, that tower still sits atop the Larkin, now used by two-way and cellular customers. 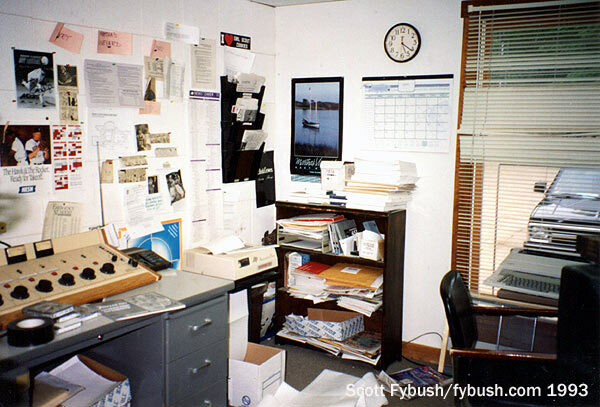 And the 1340 frequency went up the road to Lockport to become WUSJ, a sister to struggling standalone WUSJ-FM (99.3). The FM eventually went dark up there, but the AM still survives, now as WLVL. 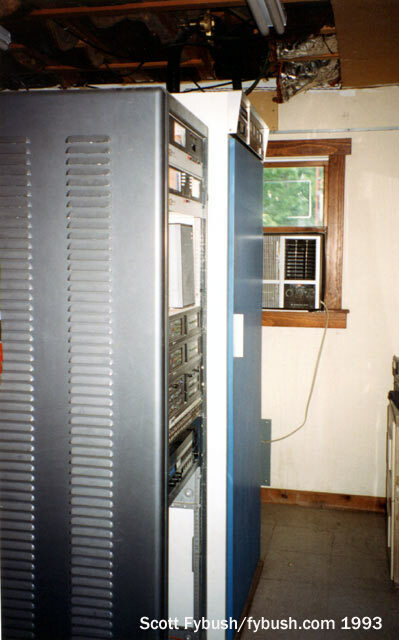 The all-news format on 970 succumbed to financial pressure by the early 1990s, and while WNED briefly considered selling off the signal or shutting it down, it survived as a more traditional public radio news-talk station, replacing the venerable WEBR calls with WNED(AM) beginning in 1993. After surviving another budget crunch a decade later, WNED found itself with another challenge: across town, WBFO (88.7) at the University of Buffalo had begun programming NPR news and talk in the 1970s. (Indeed, several key NPR fixtures, including “Fresh Air” host Terry Gross and pioneering newsmagazine creator Bill Siemering, got their start at WBFO before rising to national fame.) SUNY’s decision to sell WBFO in 2011 ended up, ironically, becoming the death knell for WNED’s AM operation: WNED purchased WBFO, merging the two stations’ formats and news operations into an AM-FM simulcast that lasted just long enough to find a buyer for the AM in the form of religious operator Crawford Broadcasting. At midnight tonight (Nov. 30), WNED will hand over the keys to AM 970 to Crawford, and the AM station will take just its third set of calls in nine decades, WDCZ, becoming a simulcast of religious WDCX-FM (99.5). But in the last few hours of WNED’s ownership here, let’s take a look around the Cloverbank Road site. 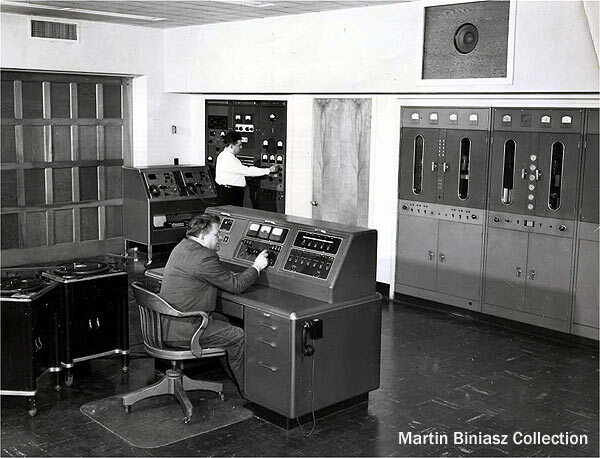 When it was built in the 1940s, there were big picture windows in front (later bricked over) and a Western Electric transmitter taking up much of the opposite wall, with a control console in the middle. 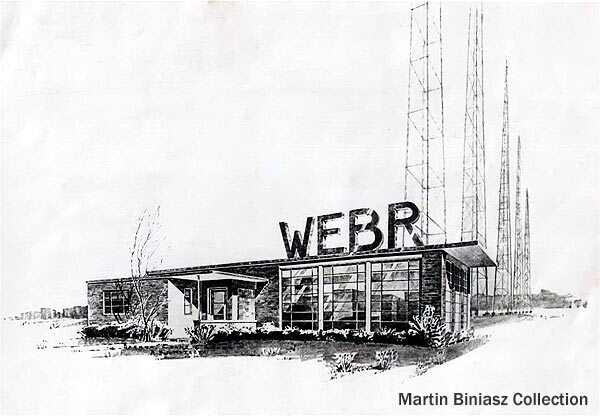 (Thanks to Buffalo broadcast historian Martin Biniasz for sharing photos from his collection, including that spiffy architect’s rendering of the new transmitter building.) The WE eventually gave way to the Harris MW-5 seen above, and a newer Harris DAX eventually found its way to the middle of the room. 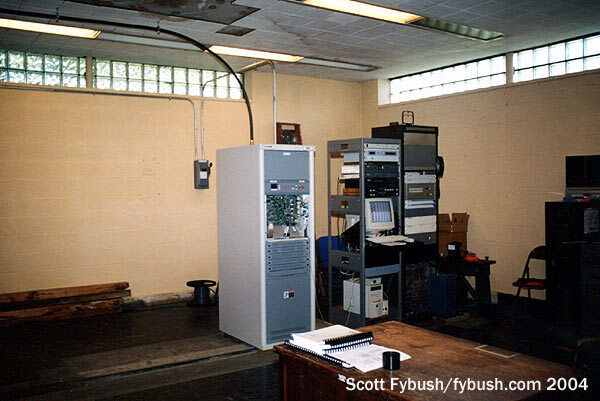 The 970 phasor ended up in a back room behind the Harris, and in 2001 a second station moved in. WHLD (1270) had been the longtime voice of Niagara Falls, transmitting from a two-tower array on Grand Island, but in a bid to improve its signal over Buffalo, it relocated down here to Hamburg with a similar directional signal to 970, using 5000 watts by day and 1000 watts at night in a tight beam aimed north over Buffalo and Niagara Falls, diplexed on all five of the 970 towers. 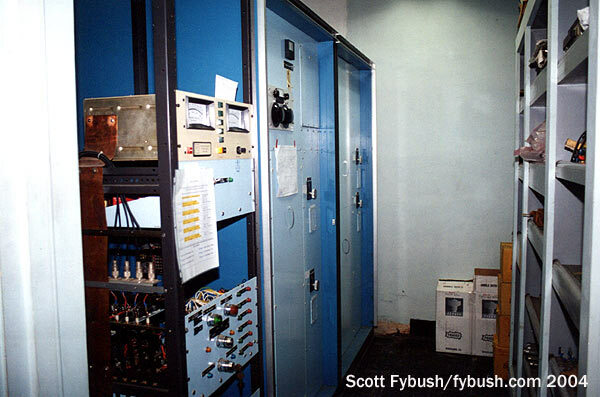 That’s WHLD’s Harris SX-5 transmitter on the left side of the back wall, and its phasor tucked into the room behind. Thanks to WMVY’s Mitch Wertlieb and WNED’s Joe Puma for the tours! This didn’t take long: there’s an application at the FCC for a change from commercial to non-commerical licensure, and a waiver of the requirement to have a studio in the City of License. WBUR promises to include coverage of news of interest to the Cape Cod and Martha’s Vineyard audiences. I listen to WBUR a lot, and I don’t notice any unusual coverage of the Cape now.